One of the most historically successful clubs in Italian football Juventus has a fiercely loyal fan base. If you have an allegiance to the black and white of Juventus, then the Juventus football shirt is a must have. Worn by players like Zinedine Zidane and Edgar Davids you could have a legend or current player on the back with our specialised printing service. 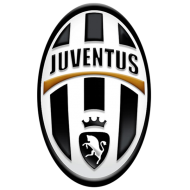 After taking their fourth consecutive Coppa Italia title and..
Children's Juventus Third Kit 2018/19Show your support for T..
Get ready for the season ahead with this Junior Juventus A..